After a first place win at the Frederick County Envirothon competition, the Catoctin High School (CHS) team placed sixth (out of seventeen teams) at the state competition in June at the Maryland 4-H Environmental Education and Camping Center in Garrett County. In the Wildlife competition, they were awarded second place. The members of the CHS team, named The Primary Successors, were Zack Carter, Samantha Grimes, Edison Hatter, Jimmy Kempisty, and Devin Shorb. With the help of advisors April Wells and Ron Albaugh, the five seniors (now graduates) prepared for the competition that included tests in five areas: aquatics, forestry, soil, wildlife, and a fifth topic that changes every year (this year, it was rangeland management). The students met not only during school hours but also on their own time to learn as much as possible about each topic. Preparation included absorbing information from books, diagrams, field guides, and websites, as well as hands-on training. When I met with the students during one of their practice sessions at the school, they were preparing for the aquatics test by identifying various fish. They know and rely on each other’s strengths during testing. Wells said that they each take one part of the exam and then work together to finalize their answers. It was obvious that they work well together as a team and that they have fun at the same time. 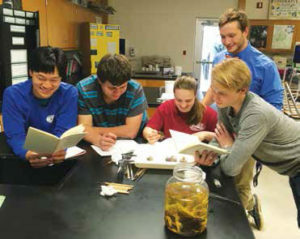 Pictured from left are Edison Hatter, Devin Shorb, Samantha Grimes, Jimmy Kempisty, and Zach Carter.